One of the easiest ways to save time in the kitchen is to make one-pot recipes: fat, protein, and vegetables all in one dish so there’s less to keep track of while you’re cooking (and less to wash up afterwards). This recipe is the grill equivalent of these one-pot dinners: an entire meal finished at once, from fridge to table in half an hour. Not only is it quick, but it’s also quite versatile. If you don’t have zucchini handy, just use yellow summer squash, asparagus, or any other vegetable that lends itself well to grilling. Even vegetables that don’t usually get the grill treatment, like Brussels sprouts or beets, would work beautifully with this recipe because the simple lemon seasoning goes with almost anything. Even though they’re not complicated to prepare, these kebabs certainly aren’t tasteless or boring. Brushing the chicken with lemon juice while it grills makes sure that the meat stays tender and the flavor sinks deep into every mouthful, and adding grilled lemons to the plate bumps up the taste even more. Cooking lemons over such high heat leaves them still lemony, but just a little bit less sour, so you can dig out the flesh with a fork and spread it over the chicken, or eat it straight, if you like the intensity. SERVES: 4 PREP: 10 min. COOK: 18 min. Squeeze the juice of 1 lemon into a small bowl. Cut the chicken into cubes 1 to 1 ½ inches on a side, and slide the cubes onto the skewers. Rub the skewered chicken with the dry oregano and season with sea salt and black pepper to taste. Grill the chicken for about 8 minutes (4 minutes on each side), brushing occasionally with the lemon juice. While the chicken is cooking, cut the zucchinis in half lengthwise. Brush them with olive oil and grill 3 minutes per side or until tender. Once the zucchinis are done, cut them into slices of about half an inch thick. Divide among the plates and sprinkle with the chives. Cut the remaining lemons in half and grill them, cut side down, for 2-3 minutes. 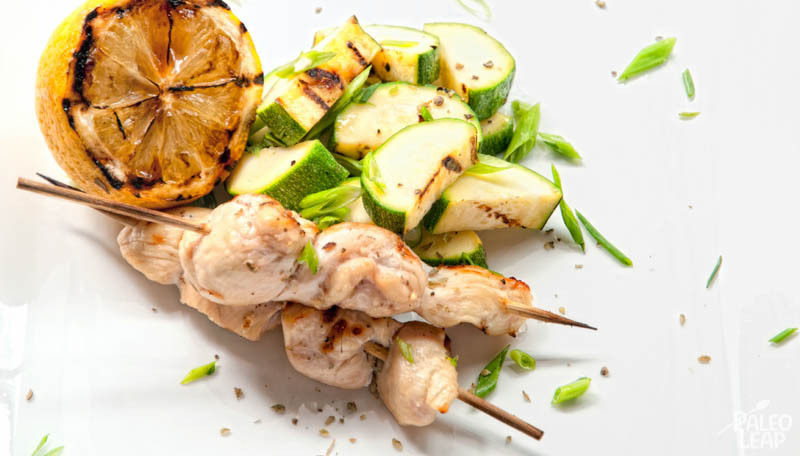 Serve the chicken skewers with the zucchinis and a grilled lemon half for each person.